Catholic leaders are denouncing the Trump administration’s decision to end Temporary Protected Status for more than 200,000 Salvadorans living in the United States. Secretary of Homeland Security Kirstjen M. Nielsen announced the decision Jan. 8. Salvadorans will have until Sept. 9, 2019 to return to their country. Salvadorans are the largest immigrant group who had received T.P.S., which is granted by the Department of Homeland Security to accept those whose home countries are suffering from ongoing conflict, environmental disasters or other unsafe conditions and protects them from deportation. “Our nation must not turn its back on TPS recipients and their families—they too are children of God,” said Bishop Joe Vásquez of Austin, Tex. In the case of Salvadorans, 88 percent are part of the workforce and they are parents to 192,700 U.S. citizen children, according to the Center for Migration Studies. Ashley Feasley, director of migration policy and public affairs at the U.S. Conference of Catholic Bishops, said families with U.S. citizen children will have to decide whether to return to El Salvador together or separate, with the children remaining in the United States. Ms. Feasly encouraged recipients of T.P.S. to consult a reputable immigration service provider like the Catholic Legal Immigration Network, Inc., and the American Immigration Lawyers Association to find out if their status can be legally changed. Bishop Kevin Vann, chairman of the board of CLINIC and bishop of the Diocese of Orange, Calif., said T.P.S. has given Salvadorans protection from the long-standing violence in El Salvador and allowed them to start new lives. Catholic Relief Services also called on Congress to act to protect recipients of T.P.S. In their statement, Catholic Relief Services also called on Congress to act to protect recipients of T.P.S. Mr. Kerwin noted a pattern over the last four months: a record low refugee resettlement ceiling; the dismantling of the Central American Minors program, which permitted refugee children from the Northern Triangle states to join parents in the United States; and the termination of T.P.S. for Haiti, Nicaragua and Sudan. “These decisions came on the heels of [the Trump administration’s] decision to terminate the Deferred Action for Childhood Arrivals program, without any substitute in place, based on exaggerated and uncharacteristic concerns over executive overreach,” Mr. Kerwin noted, adding that the president committed to reducing family-based immigration and the diversity visa program. Besides the racial and economic issues that are cited, unlike Bishop Vann, I also consider there to be a pro-evangelical Protestant factor at work here, so that those who are Muslims, Catholics, and other religions are deported. Real? Maybe so, maybe not. But in the latest round of deportations, they all come from majority Catholic nations. As one critic said, connect the dots! Pay attention NCCB....your political compromises with evangelicals on abortion have silenced you to the detriment of Catholics! In as much as about 300,00 of the total @ 325,000 Temporary Protected Status immigrants are in fact from Latin America or Haiti ...i.e. Primarily Catholic Countries, it stands to reason that such "Catholic Immigrants" received the greatest benefit from TPS. 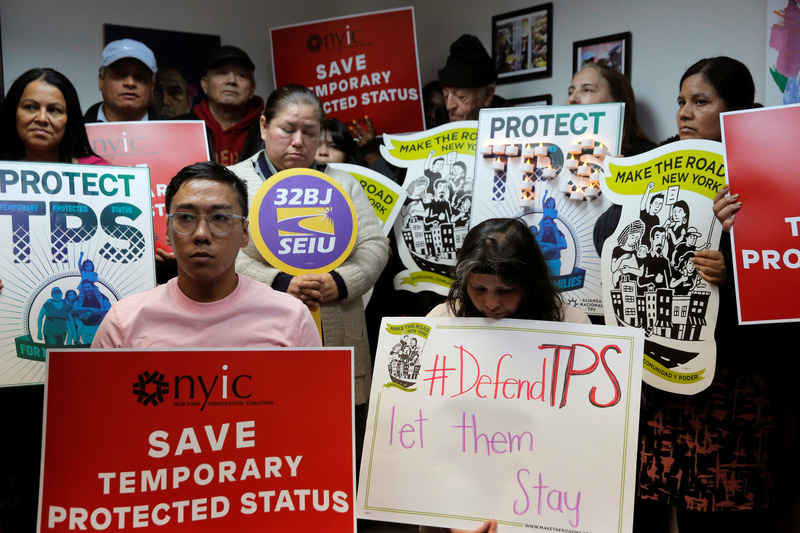 Of course if TPS actually has primarily benefited Catholics , then it will be such Catholics who will primarily be negatively impacted by adherence to the word "Temporary" in Temporary Protected Status. That is hardly an argument for a Protestant Evangelical cabal to send Catholic immigrants home . Indeed since Catholic immigrants were the primary beneficiaries of TPS , the analogue of your logic would be that TPS actually discriminates against Non Catholics and therefore should be terminated entirely!! I have long contended that a segment of Catholics in the USA has become “USA protestantized” in their attitudes and culture. They have adopted the evangelical right’s attitudes about immigration, patriotism, the United Nations, the status of Jerusalem, race, economics – the prosperity gospel, etc., etc. Ironically these second and third generation of immigrants have an exaggerated need of proving to be “American,” in a nation originally settled by Spanish Catholics but subsequently overwhelmed by anti-Catholic Europeans – English and Dutch. I have lived in several parishes where parishioners resented Spanish Masses and Latin immigrants because they don’t speak English, which is NOT the official language of the United States. In addition, the USA Bishops have actually fostered this with their own efforts to prove themselves “American” and their political compromises with evangelical right leaders on the topic of abortion. So, I connect the dots. The nationals threatened to be deported are majority Catholic. Right or wrong, it’s a conclusion which can be made and I made it. But you missed my real point. Every Bishop in the nation should be thundering from our pulpits at this attack on Catholics. They thunder about nothing - except abortion. In many dioceses it is Latin Catholics who fill the pews. They better be careful that their timidity will alienate those parishioners. By the way, your point about “temporary” holds no water. So many extensions have been granted by both Republican and Democrat presidents that it is obvious that the word “temporary” no longer applies. They are resident aliens to be sure. The fact that two Presidents "kicked the can down the road" by ignoring the law is not an acceptable excuse for the result. Change the law if you will, but ignoring the law is a receipe for the confusion and uncertainty that now reigns in the whole area of immigration. The so called "Dreamers" have been with us for decades , yet when Obama created out of whole cloth his DACA Executive Order the issue suddenly became one of imminent deportation. That was/is political nonsense. Obama failed to permanently fix the problem when he had a filibuster proof control of Congress and only acted by Executive Order in 2012 as part of his reelection strategy. I might add he spent the prior two years reciting constitutional Law as to why he couldn't issue an executive order. Again: Change the TPS law if you will/can....but in the absence of such permanent change then ignoring the law inevitably leads to chaos and social unrest. You yourself demonstrate that point by claiming that the word Temporary has no meaning! If as you argue TPS is primarily protecting Catholics why shouldn't TPS be eliminated as a law which is discriminatory against non-Catholics? Surely if the law is not discriminatory in favor of Catholics, then enforcement of it's provisions cannot be anti-Catholic. For you to suggest that the Bishops make your argument that anti catholic discrimination is afoot is to invite outright ridicule from the pews! What does the word "Temporary" mean in Temporary Protected Status? If you look at the law there is an initial six to 18 month period which can be extended by the Department of Homeland Security based on assessment of ongoing conditions in the subject country. I have no problem with the Bishops arguing that conditions are still inadequate in El Salvador for a return. But that is not the gravamen of the argument presented which gives deference to conditions but speaks primarily of separating families from natural born citizen children; loss of remittances to relatives in El Salvador; increasing poverty in El Salvador; and hindering migration in general. Hurray for the Laity, Boo that only one bishop is quoted. I assume J.D. Long-García asked Mr Appleby to justify his charges. What did Mr Appleby say in response? The economy is humming again thanks to Trump with his pro-business and pro-family tax policies. If this economic boom continues and the Wall is built then the illegals already in our country will have a better chance of permanent residency of course without ever given citizenship, basically they can stay here legally as long as they earn their keep. No public assistance. Church and private assistance is fine. No further economic migrants should be admitted until every current illegal is identified and monitored to insure that our safety and security is not at risk. Lastly, politicians need to be held accountable if they support policies such as sanctuary cities for crimes committed by illegals.